This document explores more advanced Kaltura analytics topics - when analytics are captured and media channel links. Embedding in Canvas using the Kaltura/Canvas integration. Linking to the individual media item in Kaltura Media Space as long as the media is not unlisted. The student must login to Kaltura MediaSpace to view the media. Using the “Media Channel Link”. Using the Media Gallery (essentially a channel) in your Canvas course. 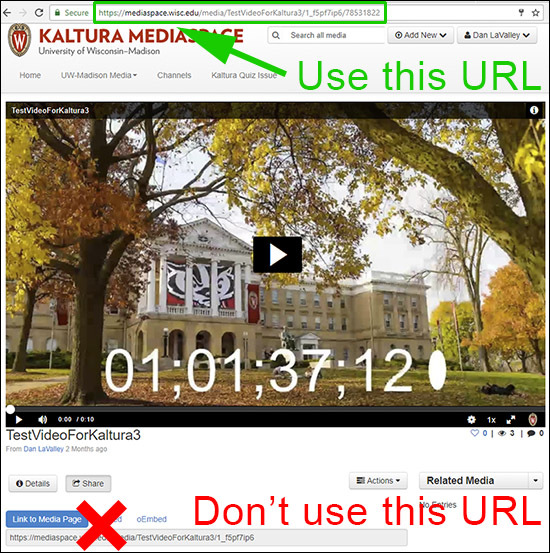 Embedding in Canvas using the Kaltura integration is outlined in Canvas - How to Embed Kaltura Media in Canvas (UW-Madison). When you link to an individual media item in Kaltura, unique user data will not be gathered if the media item is published as “Unlisted”. Instead of publishing each individual media item as “Unlisted”, you should publish these items to a channel and use the “Media Channel Link” (see below). Media channel links are links that load a media item within the context of a channel. We want to use this link because it aggregates all student views for all the videos in a course as long as the permissions of the channel are set in such a way that it requires NetID login (open, restricted, and private). This allows for a more holistic view of the students overall interactions with all the videos in a course. “Link to Media Page” links will only aggregate data at the individual media level.